For electronic music fans, dreams do come true as Made Event’s ship-captains Mike Bindra and Laura De Palma dock on the shores of Randall’s Island, New York for a second year of Electric Zoo, Labor Day Weekend (9/4-9/5). With last year’s raging success, this dynamic duo of New York’s uber-nightlife have curated the perfect numbers game for Electric Zoo 2010. Here are the metrics: two days, four stages, 70+ artists, 24 hours of open-air music performances, two official after-parties, the promise of 70-degree weather, and a 100% guarantee that an estimated 26,000 attendees are going to lose their minds. 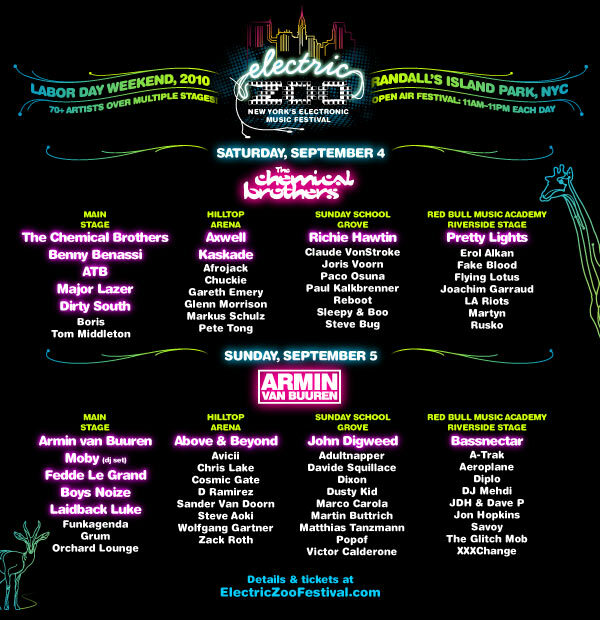 Turning two years fresh, Electric Zoo is the love child of Made Event’s commitment to professional event production and a feverish desire to elevate the presence of electronic music, especially in North America. This diverse and unique open-air music experience is proud to showcase Armin Van Buren, voted the world’s number one DJ for a third year in DJ Magazine’s Top 100 list, as well as a global roster of heavy-hitter acts like The Chemical Brothers, Paul van Dyk, Axwell, Richie Hawtin, Bassnectar, Fedde Le Grand, and Major Lazer. Other crowd favorites include Flying Lotus, A-Trak, Steve Aoki, John Digweed, Kaskade, and Diplo.